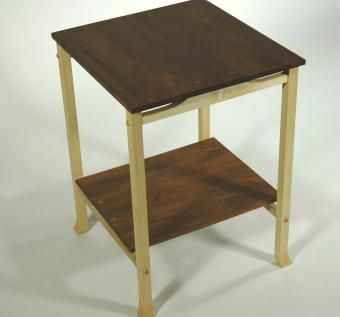 Teak And Maple End Table. This table is a collection of opposites, with opposing grains on the top and shelf, made with a combination of local maple and imported teak. The aprons demonstrate careful grain selection, as do the legs, which feature tight straight grain with a nice 'parting' feature at the foot. 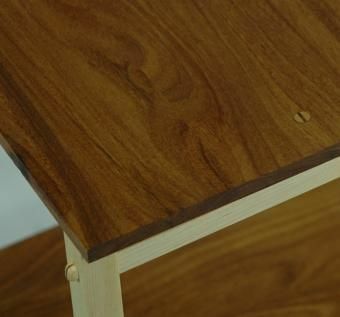 All joints feature tight mortise and tenon joinery. In this case the tenons are pillowed and wedged through-tenons. 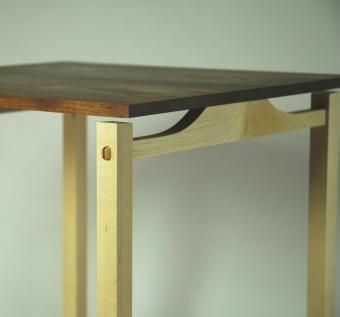 The top and shelf are attached to the table only by the maple pins. There are no metal fasteners in this table. The wedges in the top and legs are teak. As with almost all of my work, this is available in varying woods and sizes.